The stunning grounds of Chatsworth House have been transformed as part of the 11th annual ‘Beyond Limits’ show in collaboration with Sotheby’s. The contemporary, outdoor sculpture show is a highlight of the art calendar, and this year has a poignant centrepiece in the form of ‘Lilas’; the Serpentine Pavillion designed by the late Dame Zaha Hadid. 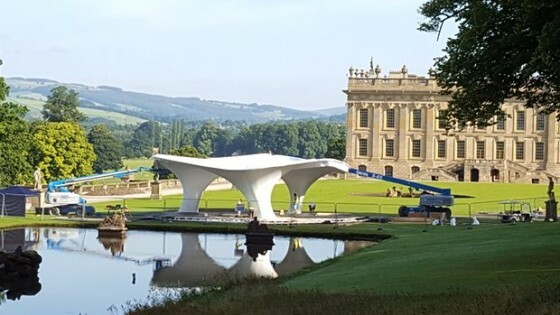 The 23sqm structure has been installed on the South Lawn of the stately home and echoes the grand conservatory which originally stood on the site. The pavilion, which hosted the Serpentine Summer Party in 2007, is made from a metal framework with tensile fabric stretched over it and perfectly demonstrates the gap bridged between architecture and art by Hadid. Although the installation of the piece was planned prior to Hadid’s death in March, it’s placement in such a grand and monumental setting seems a fitting tribute to her legacy as one of Britain’s most inspirational architects and creative influencers. You can visit ‘Beyond Limits’ at Chatsworth between Sep, 10 – Oct, 30 2016. For more information on the exhibition you can visit the Sotheby’s website. To read more about the installation of Lilas’ visit the Guardian website.